Staying in Las Vegas or nearby gives you easy access to casinos, live shows, and all other types of entertainment plus nearby national parks. 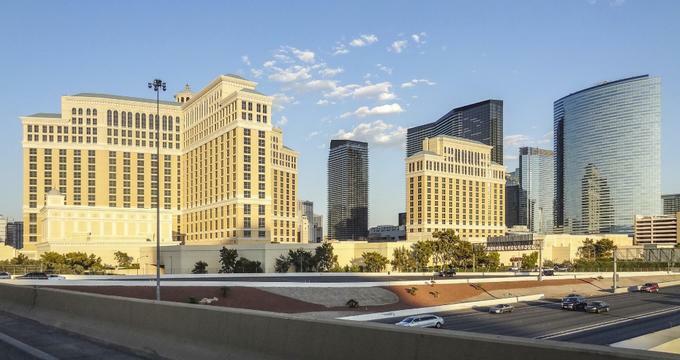 Whether you are in search of adult-only fun or a family-friendly getaway, there are dozens of Las Vegas hotels to choose from. You can stay in the center of everything on the Strip, in a quieter area of the city, or even in a nearby city like Lake Tahoe or Reno so you are close to everything but not overwhelmed by the excitement. 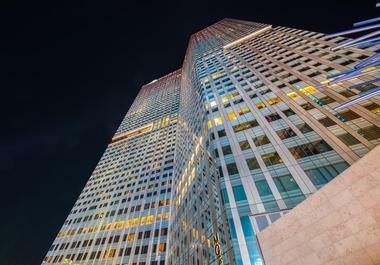 You just need to choose which of the many hotels fit your requirements for your upcoming business trip or vacation to Las Vegas and the surrounding areas. 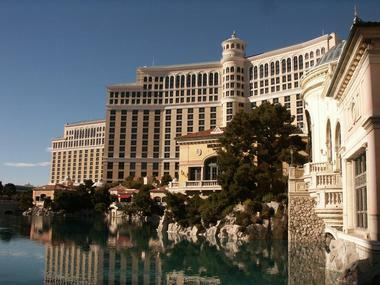 The Bellagio Hotel and Casino is among the most iconic hotels on the Las Vegas Strip, offering a range of accommodations in addition to the casino. Standard rooms have two queen beds or a king bed and views of the fountain or resort with amenities such as an ergonomic workstation, a 40-inch flat-screen HDTV in a modern entertainment center, an iHome docking station, a nightstand laptop safe, high-speed internet, lighted makeup mirror, available scale, hairdryer, stocked mini-bar, luxurious robes and linens, Exclusive Bellagio Cashmere Super Pillow Top mattress, Italian marble bath featuring a soaking tub, and a sitting area. Guests at the Bellagio are welcome to golf at once of the partner courses, swim in one of the hotel’s five pools with distinctive settings and Jacuzzis, rent a poolside cabana, or even get a poolside massage. The Concierge is there to help with transportation, reservations, and more. The Spa and Salon with its 65,000 square feet including hot Jacuzzis, a sauna, a steam room, and a cold plunge or visit the Fitness Center or Casino. Visit the Chairman’s Lounge, watch a show, dine at one of the over 15 restaurants, or get a drink at one of the five bars and lounges. 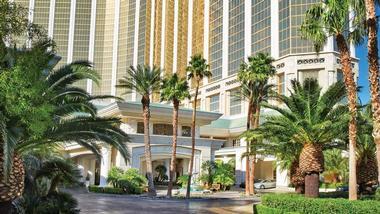 Encore is part of Wynn Las Vegas, offering an exceptional level of service and sophisticated design. Encore Resort Suites are 745 square feet with pillow-top Wynn Dream beds, overstuffed pillows, 507-thread-count linens, bedside touchscreen panels to control the room, living rooms, 55-inch TVs, oversized marble tubs, separate glass-enclosed showers, 13-inch LCD TVs in the bathroom, dual sinks, terrycloth bathrobes, and separate water closets. 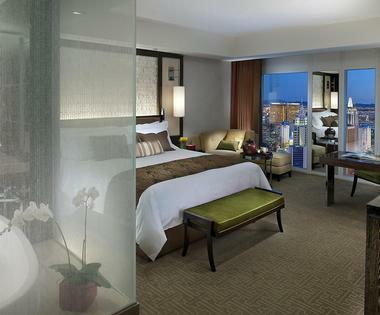 The Encore Panoramic View Suite is similar but with different views from the floor-to-ceiling windows. Make use of the fitness center with its cardio and strength equipment plus daily fitness classes and certified trainers. The Spa at Encore relaxes your mind and body while the Salon at Encore helps you look your best. Enjoy the temperature-controlled pool plus Jacuzzi spa or reserve a private cabana. Visit the Encore Theater for live performances or watch Le Reve – The Dream, an aquatic spectacular. Visit the Encore Beach Club day or night or head to one of two nightclubs after a day in the casino. Between Wynn and Encore, there are eight fine dining restaurants, nine casual dining restaurants, and six bars and lounges. The Four Seasons Hotel Las Vegas gives guests views of the Mojave Desert and the sparkling lights below. Rooms feature your choice of a king bed or two double beds plus the option of a rollaway or crib, a full marble bathroom, down duvets and pillows, hair dryers, thick terry bathrobes, in-room scales, available hypoallergenic bedding and firm or plush mattress toppers, Wi-Fi, multi-line phones with voicemail, twice-daily housekeeping, daily papers, refrigerated private bars, tea/coffee making facilities, irons, and safes. You can also choose a larger room, one with a sofa bed, floor-to-ceiling windows, or a suite. Guests have access to world-famous performances and the hotel’s Forbes Five-Star Spa without having to leave the building. 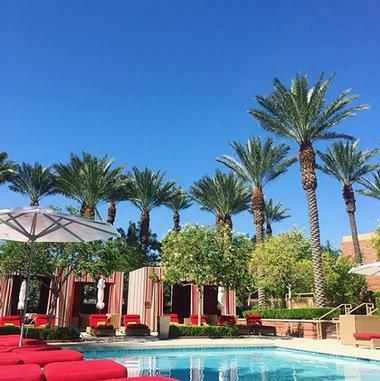 You can also enjoy the private pool on the resort’s property where you will find passed signature amenities as well as the Mandalay Bay Pools at the adjacent Mandalay Bay, where there are three pools, a real-sand beach, an adults-only beach, and a Lazy River. Take advantage of 24-hour laundry and shoeshine service or the fitness center. Enjoy a drink in the indoor/outdoor bar. Have Italian at Veranda or steak at Charlie Palmer Steak. Get a drink at Press, the Veranda Bar, Charlie Palmer Steak Bar, or the Pool Bar. The Grand Sierra Resort and Casino has over 1,900 rooms and suites with elegant appointments along with meeting space and an 80,000-square-foot casino. There is also an RV park. Grand Deluxe rooms deliver one or two king beds or two queens, daily bottled water, coffeemakers, irons, hair dryers, flat-screen TVs featuring premium HD channels, updated bathrooms with shower/tub combos, and writing desks with chairs. Other accommodations can feature marble showers inspired by spas, sleeper sofas, Concierge Lounge access, side chairs, and in-room safes. Enjoy live entertainment, the LEX Nightclub, and the casino with tournaments, table games, video poker, live poker, slots, and a sports and race book. Get pampered at the resort’s full-service spa and salon or get in a workout at the fitness center with its cardio equipment, weightlifting machines, and group fitness classes. Family-friendly activities include Grand Adventure Land, live performances, the FunQuest video arcade with laser tag, bowling, a movie theater, and a water driving range. The Concierge Lounge has a morning continental breakfast, TV, and morning paper, large TVs, and Wi-Fi. When you want a bite, choose from the 11 restaurants, which include to-go, casual, and fine dining. 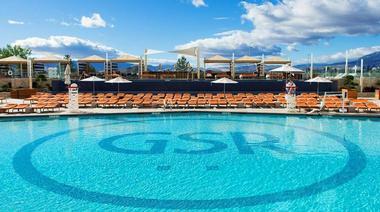 The Hard Rock Hotel & Casino Lake Tahoe provides guests with spacious and contemporary rooms with views of Lake Tahoe. This hotel has premium linens, in-room safes, mini-refrigerators, balconies, in-room yoga gear, coffeemakers in suites, iHome docking stations, complimentary newspapers, complimentary Wi-Fi, and pet-friendly options. You should also expect hair dryers, bedside outlets, multi-line phones with voicemail, irons, Pure Natural bath products, and luxurious bathroom towels. Go for a swim in the pool or relax on the deck all year-round or get in your workout at the fitness center. The concierge can help you plan activities and meals or you can visit the Rock Shop. The casino features 25,000 square feet and a William Hill Sportsbook plus varied promotions. Watch a performance at Vinyl or listen to live music or a DJ in one of the bars. Get a quick meal at Fuel, a casual one at the Oyster Bar or Alpine Union Bar & Kitchen or enjoy fine dining at Park Prime Steakhouse. There are also six bars and lounges for a relaxing drink. Harveys opened in 1944, providing rich hospitality since. There are 740 rooms and suites with chic, modern décor. There are highly affordable options, particularly for Lake Tahoe, and all rooms include at least Sealy Postruepedic mattresses, televisions, alarm clocks, irons, ironing boards, phones, Gilchrist & Soames bath products, hair dryers, and makeup mirrors. You can also get a separate tub and shower, internet, oversized tubs with jets, suites, and either non-smoking or smoking rooms. There are more than 88,000 square feet filled with gaming, plus more than 1,200 slot machines and almost 100 live action table games plus a Sports/Race Book. Attend the Summer Concert Series at Harveys Lake Tahoe or attend a show at the Improv any time of the year or other concerts throughout the year. 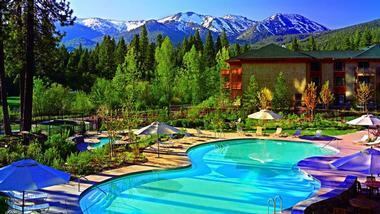 Guests get preferred access to Edgewood Tahoe Golf Course and enjoy on-site specialty shops. Get something small to eat at Cinnabon, Carvel Ice Cream, or Starbucks. Or you can get California-style pizzas at Straw Hat Sports Bar & Grille, Tex-Mex at Cabo Wabo Cantina, steak at the upscale Sage Room, or your choice from the eclectic menu at the upscale 19 Kitchen Bar. Guests at Hyatt Regency Lake Tahoe Resort, Spa and Casino can appreciate the natural wonders of the area in addition to the casino. The 422 guestrooms and suites plus Lakeside Cottages have beverage centers, plush Hyatt Grand Beds, and fireplaces. Sample room amenities include safes, mini-fridges, 65-inch HDTVs, work areas, pillow-top mattresses, hairdryers, coffeemakers, irons, individual climate controls, and Deluxe KenetMD bath amenities. Or consider a room with a balcony, a suite, or a cottage. The resort offers free ski shuttles and rentals for skis and snowboards. Have a full spa day at the Stillwater Spa or see if you can win big at Grand Lodge Casino. Other hotel amenities include room service, Wi-Fi, a fire pit, a Sport Shop, the fitness center, the concierge, laundry, golfing, and a kids’ program. There is even a private beach with boat tours and watercraft rentals plus a heated pool open year-round. Those with access to the Regency Club Lounge can enjoy breakfast, snacks, and evening hors d’oeuvres. There are ten options for a meal or drink, or order room service. 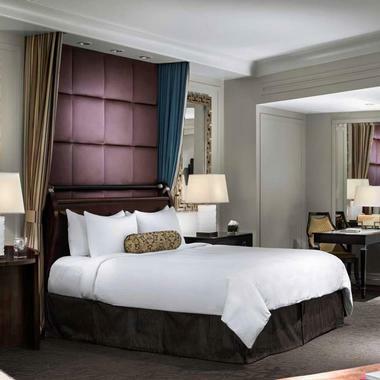 The JW Marriot Las Vegas Resort & Spa has spacious suites and rooms, superb customer service, and a convenient location. Rooms have ergonomic workstations, air conditioning, soundproof windows that can open, daily newspapers upon request, pillow-top mattresses, oversized bathtubs featuring spray jets, separate showers, double vanities, Revive bathroom amenities, robes, hair dryers, lighted makeup mirrors, safes, chairs, irons, coffeemakers, mini-fridges, two phones, available internet, and 40-inch TVs with cable/satellite and premium movie channels. Or consider a room with a balcony or upgrade to a suite with an extra half bath. Make use of the business service center when needed. This is a family-friendly resort with the Spa Aquae with salon services as well, a waterfall pool, a modern fitness center with all the equipment you need, and a championship-level golf course. Rampart Casino has more than 1,500 of the latest machines for keno, video poker, and slot, including hundreds of penny machines plus 26 table games, bingo, and a race and sports book. Enjoy a breakfast buffet, American food at Hawthorn Grill, Starbucks, Italian at Spiedini Ristorante, Japanese at Shizen Japanese Restaurant, the Clubhouse Deli, American at Waterside Grille or the Promenade Café, or international at Rampart Buffet. The Mandarin Oriental sits in the heart of the Strip for views of the desert and city in a non-smoking and non-gaming environment. The 392 suites and rooms have sleek décor with Asian-inspired touches plus walk-in wardrobes, baths, walk-in showers, high-speed Wi-Fi, sofas, floor-to-ceiling windows, and/or dragon sculptures. Suites add living rooms with desks and sofas while Signature Suites are on higher floors and have bars, dining rooms, and pantries. The property’s spa has a Forbes Five-Star award and covers two floors with 16 private rooms, a Chinese foot spa, relaxation lounges, heat and water experiences, a spa boutique, and a beauty salon. Join a Pilates or yoga class or use the fully-equipped fitness studio; personal training is also available. When you get hungry, enjoy modern French at Twist by Pierre Gagnaire, contemporary Asian at MOzen Bistro, a drink at the Mandarin view with its floor-to-ceiling windows, afternoon tea in the Tea Lounge, or casual new American at the Pool Café. 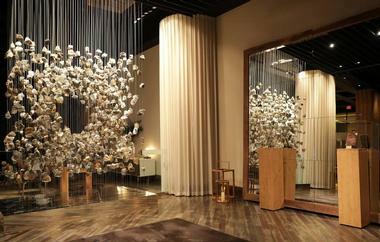 The ARIA Resort & Casino Las Vegas has everything you need right on the property, from a casino to a salon to dining. All accommodations offer express mobile check-in, corner views, turndown service upon request, e-newspaper access, free internet (wired and wireless), plush robes, entry foyers, dressing areas with dual closets, laptop safes, fully-stocked intelligent mini-bars, 42-inch HD LCD TVs, 10-inch tablets for controlling temperature and lights among other features, connectivity panel, workstation, private water closets, granite dual sink vanities, soaking tubs, and baths. Tower Suites add the option to check-in in the Tower Suites Lounge, personal concierge, welcome amenities, and curbside meet and greet. Go for a swim in the ARIA main pool or one of the other two pools when the urge strikes or get in a work out at the Fitness Center. Guests get exclusive access to various on-site amenities, such as preferred tea times at the Shadow Creek Golf Course, guest rates for Spa Facilities Passes, a dedicated VIP host in the Alibi Ultra Lounge, and complimentary admission to JEWEL Nightclub Mondays. Those with access to the Tower Suites Lounge can find non-alcoholic beverages and light snacks there. There are 20 on-site restaurants to choose from plus nine bars, lounges, and nightclubs. 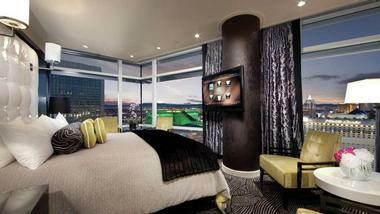 The ARIA Sky Suites are luxurious suites sitting above the Strip with amazing views. Each Sky Suite has a seating area and living room, powder room, LATHER bathroom amenities, and in-room tablets for controlling curtains and lighting plus ordering room service and more. Suites have one or two bedrooms with up to 2,060 square feet. Other amenities include plush robes, enhanced turndown service, safes, fully-stocked mini-bars, welcome stone foyers, 52-inch HD TV in the living area complete with full device connectivity, a 42-inch HD LCD TV in the bedroom, Wi-Fi, complimentary use of an iPad/laptop, a workstation, a custom ARIA mattress, and an air bath whirlpool tub and 20-inch LCD TV in the bathroom. Staying at the ARIA Sky Suites gives you access to all the amenities at ARIA, including the spa, salon, fitness center, three pools, casino, and more. There is also a private pool just for the Sky Suites plus personalized assistance. Enjoy a complimentary luxury ride to and from the airport, personal concierge, and access to the Sky Suites Lounge, where you check-in. Find complimentary soft drinks, juice, tea, and coffee, seasonal snacks, and light pastries in the Sky Suites Lounge at all times plus a nightly cheese and wine pairing. Enjoy the night at JEWEL Nightclub or dine at one of ARIA’s 20 restaurants. 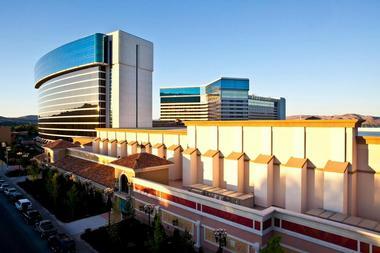 The Atlantis Casino Resort Spa is a Reno casino and hotel with luxurious accommodations and an award-winning spa. All accommodations have premium hotel Wi-Fi, wired high-speed internet, iHome clock radios plus iPod docking stations, 42-inch flat-screen HDTVs in bedrooms, Custom Sealy pillow-top mattresses, bottled water, dual line phones, individual climate control, digital safes, special bath and body products, Rainforest Alliance Certified coffee, and 24-hour room service. Suites add 20-inch TVs in the bathroom while rooms in the Luxury and Spa Towers add plush guest robes and fridges. Concierge Tower rooms add VIP check-in, express key-card access glass elevators, available personalized butler service, fully-stocked mini-bars, and amazing views. You can also choose a Jacuzzi suite. All guests of Atlantis have access to the outdoor pool, the indoor atrium pool, the whirlpool spa, the Fitness Center, and the Cardio Theater. Rent a private cabana with a safe, bottled water, fridge, TV, Wi-Fi, and more. Enjoy the on-site Atlantis Casino and regular events. 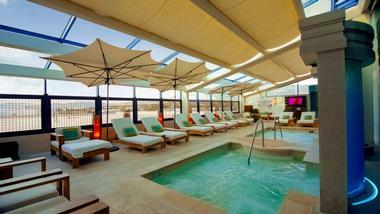 Spa Atlantis is the very first Forbes four-star luxury spa in Reno. There is a complimentary airport shuttle. Those in Concierge rooms can access the Concierge Lounge with its afternoon hors d’oeuvres and continental breakfast. There are 11 dining options, plus bars and lounges. For those visiting Lake Tahoe, MontBleu offers 438 luxurious hotel rooms, many of which have spectacular views of the mountains and lake. Deluxe Rooms have free wireless internet with available upgrades along with your choice of two queen beds or a king bed and either smoking or non-smoking. Sierra Suites have a wet bar and the option of adjoining rooms. Tahoe Suites add those features and an oversized Jacuzzis with room for two, separate showers, and two plasma TVs. 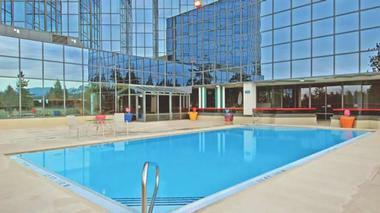 Enjoy a dip in the indoor swimming area with heated pool and seating area. There is also an outdoor patio and whirlpool spa plus changing areas and lockers. Break a sweat in the Fitness Center. Onsen Spa is the only spa within Lake Tahoe with Ashiatsu massages, along with other treatments, dry saunas, whirlpools, and eucalyptus steam rooms. If you visit the Salon, you get complimentary access to the spa facilities. Head to the MontBleu Casino for slots, video games, table games, and The Party Pit (Sportsbook). Ciera is a steak and chophouse or enjoy any meal at Café del Soul. Get something quick at Montbleu Café, have some Asian-Chinese at Fortune, or enjoy the Buffet. Get a drink at the Craft Beer Bar or HQ Center Bar. The Border House at Crystal Bay delivers luxury to North Lake Tahoe visitors in its three-story historic landmark. There are ten guest rooms with amenities like plasma TVs, gas fireplaces, chromotherapy tubs, wireless internet, and eco-friendly toiletries. 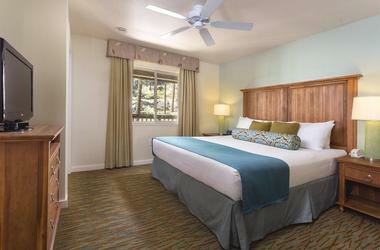 You will notice each room has unique furnishings, including warm woods and marble bathrooms. Make use of the complimentary self-parking or the business services. The on-site Crystal Bay Casino is a major attraction with its state-of-the-art showroom featuring Slots, a Sports Book, Table Games, and Live Entertainment. They also offer easy access to outdoor activities like mountain biking, fly fishing, and more. Or check out one of the touring productions and musicians at Crystal Bay’s two venues. Enjoy fresh food, Wi-Fi, and delicious coffee at Bistro Elise or find an extensive wine list at the Steak & Lobster House. As one of the MGM Resorts in Las Vegas, Delano delivers luxurious accommodations and access to many features of nearby MGM Resorts. Dogs are welcome for a small fee. Select from king or queen suites, scenic suites, two-bedroom suites, luxury suites, or options like the penthouse and strip view suites. Amenities include separate living areas, two LED HDTVs, desks, TV Media hubs, wet bars with stocked mini-bars, laptop-friendly safe, dual closet armoires, soaking tubs, plush robes, and BATHHOUSE Spa amenities. The Delano Beach Club is open just to hotel guests, including a luxurious pool club, submerged chess board, chaise lounges, and signature cocktails. Explore the Delano Art Series, take advantage of the Concierge, use the Bathhouse Gym with state-of-the-art equipment, or get pampered at the Bathhouse Spa with its 12 treatment rooms. Or visit nearby MGM amenities, such as Moorea Beach Club for guests over 21, Mandalay Bay Beach Club, Mandalay Bay’s Casino, or Topgolf. Choose from three restaurants, a lounge, and a café for your food needs, or opt for in-room dining. 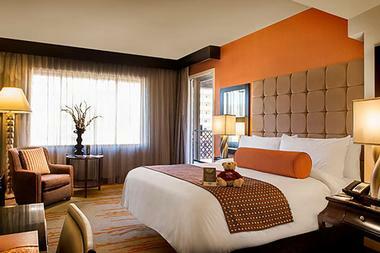 Eldorado Resort Casino delivers luxury accommodations and a casino on the same property for the convenience of guests. Guests can choose from Deluxe Rooms, Superior Rooms, or Newly Remodeled Luxury Rooms, all of which are available as king or queens. Amenities include air conditioning, sitting/living areas, shower/tub combos, hair dryers, designer toiletries, irons, in-room safes, phones, voicemail, wireless internet, high-definition TVs with cable and Pay-Per-View, video check-out service, desks, and/or loveseats with pull-out beds, depending on room type. 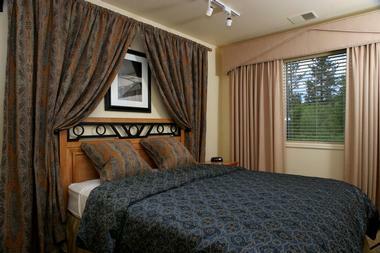 You can opt for a smoking or non-smoking room and all have full-service housekeeping. Guests are welcome to use the Fitness Center to get in their workouts or attend one of the many shows on site. Visit the Casino with its ONE CLUB program, table games, sports and race book, slots, and keno. There are twelve food and drink venues between coffee, food, a bakery, the Buffet, and alcoholic drinks. Enjoy drinks and dancing at NoVi, the hotel’s latest nightspot with a DJ on certain nights and other specials and live entertainment. Northlakes Lodges & Villas is one of the properties from QM Resorts. 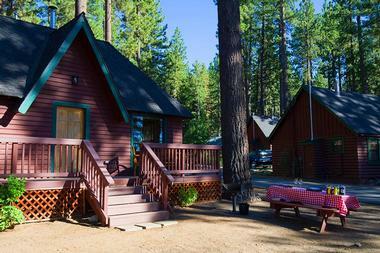 This quaint boutique resort is within Incline Village in Lake Tahoe, right by the main thoroughfare. There are choices as small as lodge studios up to one bedrooms or villas with space for eight guests. North Lake Lodges can be studios with queen-sized murphy beds, flat-panel TVs, gas fireplaces, and fully-appointed kitchens with pots, pans, utensils, dishes, granite countertops, dishwashers, stoves, and fridges. Or they can be one-bedrooms with queen beds, sofas featuring hide-a-beds, and the same amenities. Those staying in North Lake Villas have an expansive area with Wi-Fi, balconies or patios, two full kitchens, flat panel TVs, a gas fireplace, marble bathrooms, a leather sofa and love seat, two bedrooms, living areas, queen hide-a-beds, and a loft area featuring a private Jacuzzi. By staying in the resort, guests can use the amazing private beaches in Incline and get easy access to all the nearby attractions like world-class skiing. Use the outdoor hot tub no matter the time of the year. Other on-site amenities include barbeque grills, a garden, free self-parking, a 24-hour front desk, concierge services, and tour/ticket assistance. Peppermill Resort Spa Casino has 1,621 guest rooms, including Tuscany Tower which has 600 accommodations, all of which are suites. Exact in-room amenities vary based on room type and which tower it is in. The North and West Wings are budget-friendly with hair dryers, vanity mirrors, terry cloth towels, triple sheeting, custom-made plush double pillow-top mattresses, sitting areas/parlors, writing desks, irons, video checkout, writing desks, 24-hour room service, fridges, Keurig coffee machines, two phones, 42-inch LCD high-def TVs, and alarm clocks with power outlets and USB ports. Get pampered in the 33,000-square-foot and three-story Spa & Salon Toscana with its 24 treatment rooms. This is the only Caldarium in North Nevada with a sun deck, indoor pool, and a full-service salon. Visit the 82,000-square-foot casino to enjoy table games, poker, slots, and sports and race book. Guests are welcome to use the 9,900-square-foot fitness center or go for a swim in one of the two pools. Relax in one of the three outdoor jetted spas that get their heating from on-site geothermal energy. You will also find free wireless internet for guests and designer boutique shopping. Pick from one of the ten award-winning restaurants and 15 bars and lounges. There is also an on-site nightclub, EDGE. The Red Rock Casino Resort & Spa gets its inspiration from the mountains nearby while paying homage to elegant and modern resorts from the middle of the century. Expect amenities like private bars, irons, separate showers and bathtubs, in-room safes, multi-line phones with data ports and speakers, plush terry robes, iPod docks, shoe shine service, 15-inch LCD TVs in the bathroom, 42-inch high-definition plasma TVs in the bedroom, and complimentary morning papers. Consider suites, Signature Suites, or Villas for additional space. The Backyard Pool has over three acres of swimming poolside space with 19 private cabanas, a waterfall island, and swim-up gaming. Make use of the concierge, the 24-hour fitness center, movie theatre, Kids Quest indoor playground, bowling center, and the shuttle to the Strip and airport. The casino is a major attraction with more than 60 gaming tables, 2,700 video poker and slot machines, casino bingo, poker, and keno. You can find nightlife, concerts, and other entertainment on site, including at the Rocks Lounge. Experience fine dining at T-Bones or Masso Osteria, dine at the Feast Buffet, try Taste the Rock, or choose from seven on-site casual dining restaurants. There is also a food court with ten “quick eats” plus a bake shop and in-room dining. 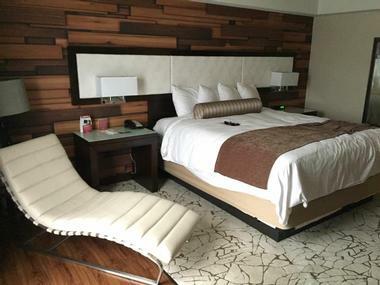 Guests at the Silver Legacy Resort & Casino have the choice of Deluxe, Luxury, Superior, Panoramic, or Premium Rooms, all available with a king bed or two queens. In-room amenities include Presidential Suite Plush Mattresses, Damask throws, triple sheeting, individual climate control, irons, full-length mirrors, ergonomic chairs and desks, armchairs, phones with voicemail, wireless internet, clock radios, cable 32-inch high-definition LCD TVs, and Pay-Per-View movies. The resort has a 24-hour front desk, shoe shine service, dry cleaning and laundry service, an Executive Business Center, full-service housekeeping, and salon services. Those interested in the casino will find 85 table games, an all-new poker room, Pai Gow poker, race and sports book, keno, and more than 1,200 slot machines. Catch a live show at the resort or visit one of their five lounges and bars. For a meal, head the Flavors! The Buffet, Pearl Oyster Bar and Grill, Canter’s Delicatessen, Sterling’s Seafood Steakhouse, or Café Central. Or get something small at Sips Coffee and Tea or Starbucks. The Cosmopolitan of Las Vegas has residential-style living spaces featuring private terraces and a 100,000-square-foot casino. Expect a welcoming, calm atmosphere and a large and luxurious bathroom featuring marble floors. Choose a space with an oversized living area, oversized or wraparound private terrace with sliding glass doors, Japanese soaking tub, telescoping doors leading to a separate living room, wet bar, sub-zero fridge, or a 6-seat conference table. For extravagance, opt for the Bungalow or the Chelsea Penthouse. Spend some time in the casino with its slots, events, tables, and sports and race book. Shop at the hand-selected boutiques, swim in the Pool District with its three pools, admire the art, work up a sweat in the tennis courts of fitness center, get help from the concierge, use the business center, or get pampered at the Sahra Spa & Hammam or Violet Hour Salon. For entertainment, check out the Marquee nightclub and dayclub, the OPIUM Theatre, or dive-in movies. Dine at Block 16 which opens fall 2018 or one of the 20 existing restaurants. There are five lounges and bars as well to help you unwind. The Lodge at Kingsbury Crossing gives guests the option of staying in a boutique resort within Heavenly Valley, complete with breathtaking mountain views, all without any resort fees. One-bedroom suites have one bathroom, a hair dryer, a separate living area, a dining area, a partial kitchen with a coffeemaker and microwave, a small balcony or patio, a fireplace, a queen bed, and a queen sleeper sofa. The two-bedroom suite can sleep six and adds a bedroom, also with a queen bed, but otherwise shares amenities. The location of the resort places guests right by skiing, boating, dining, casinos, and shopping. The team at the resort greets guests and plans activities throughout the week. There is a complimentary Saturday breakfast for guests and staff to “meet and greet.” This is also a vacation ownership resort, but anyone is able to stay at the Lodge’s suites. 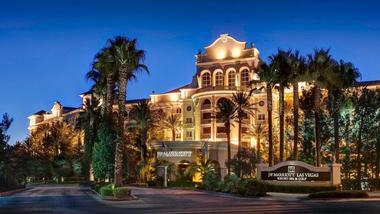 The Palazzo has the largest standard suite along the Strip, nearly twice as large as the average Vegas hotel room. Luxury Suites have Grand King beds, separate living rooms, work desks, oversized coffee tables, safes, remote-controlled Roman shades, four TVs, an iHome alarm clock, dining tables, oversized bathrooms featuring Roman tubs, private water closets, glass-enclosed showers, dry vanities, makeup mirrors, and complimentary parking. Bella Suites have two plush queens and similar amenities. Other suites have Italian marble foyers, double-door entrances, jetted tubs, Italian marble bathrooms, and/or pool tables or pianos. 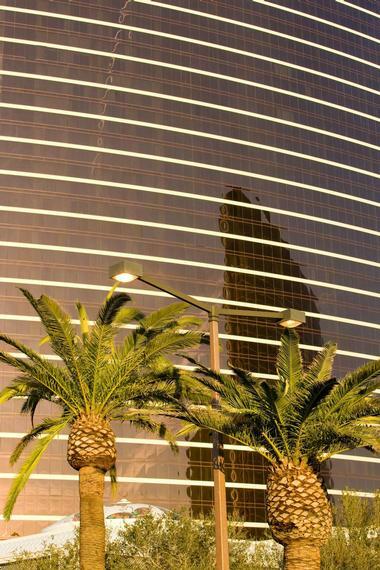 The resort offers free valet and self-parking, the choice of ten pools to swim in, 24-hour in-suite dining, a spa fitness center, and the casino with poker, Imperial Baccarat, Stadium Blackjack, slots, race and sports book, and table games. The Palazzo is home to The Venetian, with popular shows like BAZ and Human Nature: Jukebox and other occasional productions. TAO Nightclub is open on weekends with cocktails available the Dorsey and Rosina every night. Dine at one of the ten Signature Restaurants, 22 other restaurants, or 19 places with “quick bites.” Or get a drink at one of the three bars and lounges. WorldMark South Shore lets guests get easy access to storybook boating and world-renowned skiing along with miles on end of scenic hiking. The resort suites have one, two, or three bedrooms, sleeping between four and eight guests and measuring between 846 and 1,255 square feet. The master bedroom always has a king bed while extra rooms have two twins or a queen bed and the living area has a double Murphy bed. The suites also have full kitchens, washers, dryers, separate living/dining areas, gas fireplaces, whirlpool tubs, and private terraces or balconies with barbecue grills. You can add daily housekeeping to your accommodations. To relax, play billiards or ping pong or work out your stress in the fitness center. You will also find seasonal adult and children’s pools and year-round outdoor hot tubs. The recreation center also has plenty of arcade games. Zephyr Cove Resort lets you stay in a natural setting just a few minutes’ walking distance from the beach, marina, restaurant, and lake cruises. There are 28 cabins plus four guest rooms in addition to camping and RV options. The rooms in the lodge can fit two to six guests depending on layout and include private bathrooms, coffeemakers, microwaves, mini-fridges, and daily linen/towel service. The cabins keep their original charm while delivering modern conveniences and include cable TVs with HBO, fully-equipped kitchens, private bathrooms, gas fireplaces, Wi-Fi, daily towel and linen service, and coffeemakers. They are pet-friendly for a small fee and some have lake views. When the urge strikes, go for a swim in the lake, which provides a natural swimming spot for guests. Other activities include access to lake cruises, fishing, boating, watercraft rentals, beach chairs and umbrellas, volleyball, and snowmobile tours. If you stay on the RV and campground area, you get free Wi-Fi in the resort lobby plus restaurant, laundry facilities, an outdoor patio, toilets and showers, vending machines, and access to the other resort amenities. Zephyr Cove Restaurant has local, sustainable cuisine with a full drink menu and famous milkshakes. Sunset Bar & Grille is open seasonally with indoor and outdoor seating.